Carmine’s family restaurant in New York serves Italian food and is perfect for larger groups or families. A visit to this family restaurant guarantees a pleasant and affordable evening. Prices may seem high, but since all dishes are intended to be shared, the final bill isn’t too bad! Carmine’s has two locations: Carmine’s on the Upper West Side and Carmine’s Times Square. They serve Southern Italian dishes: think fresh seafood, traditional Italian meat dishes, delicious pasta and antipasti. Portions are large and meant for sharing. You can easily order one dish per course with your table mates. Ideally you go for dinner as a group of four or more, as most dishes are made to serve four people, but you can always take home a doggy bag. If you would like a three or four course meal, Carmine’s is an affordable option compared to many other restaurants in the city. Carmine’s has an extensive menu. 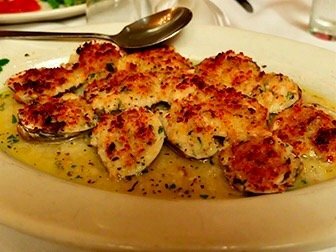 As a starter I (or rather we) almost always go for the Baked Clams. A dish full of flavour, with loads of garlic. For the main course, I recommend the Penne alla Vodka; a vegetarian pasta with a vodka-garlic sauce. I usually also feel like ordering a meat dish, so would go for the Veal Parmigiana as a side: a large breaded veal cutlet in a tasty Italian tomato sauce, topped with melted mozzarella. Not sure what to order? Get an Italian surprise with the Four Pasta Special! I never have to think twice about dessert: homemade tiramisu of course. In 1990, Artie Cutler, Godfrey Polistina and Michael Ronis opened the first Carmine’s in the Upper West Side. With Cutlers vision of creating an ‘Italian-American wedding atmosphere’ for the public, night after night. In addition to providing portions big enough to share amongst friends and family. The American Golden Age interior has been the inspiration of many Italian restaurants throughout the United States. Now, this legendary Italian family restaurant has several branches, both in and outside of New York. All remaining true to the original vision. Great food, good wine and an atmosphere to make you feel right at home. Eric’s Tip: Carmine’s is a good choice if you are part of a large group. Do you have tickets to a Broadway musical? Visit the Carmine’s branch in the Theater District before or after the show. Personally, I prefer the Upper West Side location as it has mainly local visitors, so is a bit quieter. Book your table well in advance at both branches though! Especially if you want to dine there during the holidays. I like to eat at Carmine’s with my family during Thanksgiving or Christmas and I make sure I reserve my table at least three months in advance.